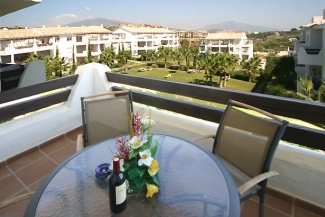 Our luxury first floor apartment is situated between Marbella and Estepona, in the Selwo Hills development, close to the beach and numerous golf courses. It is beautifully furnished and fully equipped with everything you could possibly need to ensure that you have a superb holiday. There are two bedrooms, two bathrooms, a large living room, a kitchen with separate laundry room and two terraces. The Master Bedroom has a 5` bed, ample fitted wardrobes and drawers, a television, clock radio and hairdryer. There is a door that opens onto the Main Terrace. The fully tiled En-suite Bathroom has a washbasin set in marble, toilet, bidet, bath with shower over and a separate shower cubicle. The Second Bedroom has two 3` beds, fitted wardrobes and drawers, a television, clock radio and hairdryer. 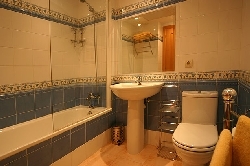 The fully tiled Guest Bathroom has a washbasin, toilet, bidet and bath with shower. The Living Room is attractively furnished with two comfortable leather couches, a glass-topped dining table with six chairs and matching sideboard, a coffee table and it has sliding patio doors onto the south-west facing Main Terrace. There is a 37" LCD television with most Sky channels, a DVD player with a selection of films and a portable music centre with numerous cds. The square shaped Main Terrace is very spacious, and furnished with a glass topped dining table with six chairs and two matching sun loungers and there is a ceiling fan with light. There are sea and mountain views and there is direct sun on this terrace from mid afternoon until sunset. The Kitchen is fully equipped with oven, ceramic hob, large fridge/freezer, dishwasher, microwave, electric kettle, toaster, hand blender and electric juicer. The washing machine and tumble dryer are situated in the adjoining Laundry Room where there is a washing line, clothes airer, ironing board and iron. There is a door from the Kitchen to the smaller east facing Kitchen Terrace, which overlooks the sub-tropical gardens and swimming pool. It is furnished with a round glass-topped table and four chairs - perfect for catching the sun over breakfast and indeed all morning. The apartment has marble floors and full air-conditioning and heating. There are roll down shutters at all the main windows for privacy and security. There is a reserved underground parking space and a lift from the garage to all floors. 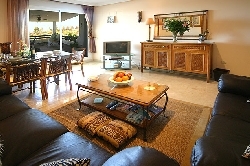 There is a gym, games room and sauna situated near the swimming pool.